To demonstrate the influence of heat on performance we compared the times in 2014 when the temperature was 13º-14º and the humidity 68% with the times in 2015 when the temperature was 27º-29º and the humidity 40%. 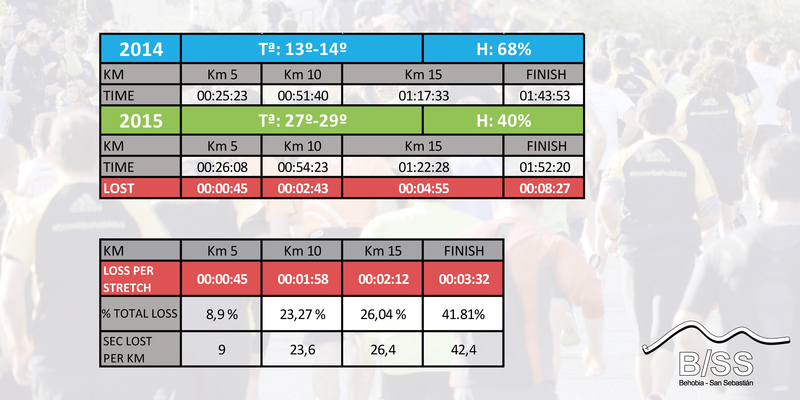 Comparing the average time of all the participants in 2015 with those in 2014 you can see that in the 2015 edition it took an average of 8 minutes and 27 seconds more to complete the race than in 2014. If we analyse this time loss at each timing point, we see that the loss in time was not constant. In the stretch Start-km 5 only 45 seconds were lost , in km 5-10 one minute and fifty-eight seconds were lost, in km 10-15 two minutes and twelve seconds were lost and in the km 15-Finish the time lost was 3 minutes and 32 seconds, nearly 5 times more than in the first stretch. The conclusions drawn from this data is that the participants in general started out with the idea of fulfilling their objectives, straining themselves to do so without bearing in mind the effects of heat on the organism. For this reason in the first 5 km only 45 seconds on average were lost, representing 9 seconds per km. In the next 5 km, 23.6 seconds were lost per km, as the pace stabilised, increasing slightly to 26.4 seconds per km from the timing points km10-15 and finally faltering due to the initial effort and losing up to 42.4 seconds per km, nearly 5 times more than in the first stretch. Bearing in mind that the average loss of time at the Finish was 8 minutes and 27 seconds and bearing in mind that the ideal would be to maintain as steady a rhythm as possible, the loss per km would be 25.35 seconds. So, from the data it can be deduced that participants in the last stretch paid for the efforts made in the first leg of the race.